Yealink CP860 IP Conference Phone | 8x8, Inc. 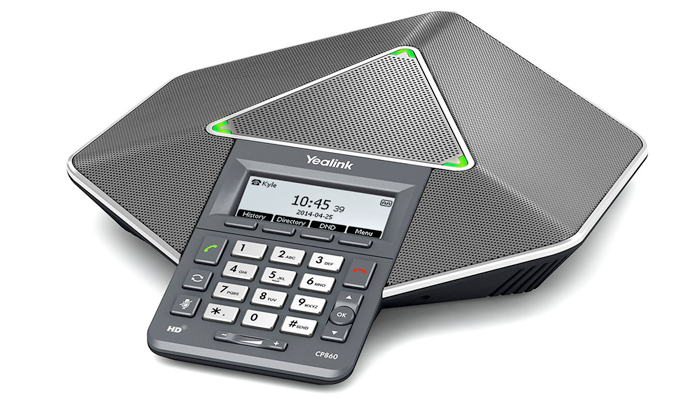 The Yealink CP860 IP conference phone is a perfect choice for small and medium-sized conference rooms and offers a range of up to 10-feet and 360° voice pickup. The CP860 provides many important audio features including optima HD technology, a built-in 3 microphone array, full-duplex technology and acoustic echo cancelling. This IP conference phone lets users enjoy rich, clear and life-like conference calls. The Yealink CP860 also supports linkages to mobile phones or PCs for a more convenient conference call experience. HD Audio —The CP860’s optima HD voice, full duplex technology and acoustic echo cancelling lets users enjoy zero-distance communication with all other participants in the room or located remotely. Outstanding voice pickup —With its built-in 3 microphone array and outstanding audio performance, the CP860 provides up to 10-feet and 360° voice pickup as standard, with broader coverage using up to two optional expansion microphones. This allows users to move around freely in the conference room without reducing the voice quality experience. Multiway conference, more flexible collaboration — Up to five participants can join any phone bridge supported conference call. This significantly improves communication between users located in different regions. Seamless connection to mobile phones or PC — Users can easily connect their mobile phones or PCs to the CP860 through a connecting cable. Turn any phone call into a high quality conference call (a unique Yealink feature).